Despite the evident advantages of combining masonry with prestress, their joint use has been poorly exploited during the last decades. This paper claims the high potential of masonry as a primary load-bearing material when combined with post-tensioning. This work deals with arch footbridges and antifunicular structures. With respect to the first, this research illustrates the introduction of external loads by internal post-tensioning to favourably increase the axial forces in a masonry arch, and consequently improving its structural behaviour. With respect to the second, this work shows how bending moments in a non-funicular 2D curved geometry can be eliminated through an external post-tensioning system. In summary, this research strongly expands the range of post-tensioned masonry structures that exhibit a bending-free (or quasi bending-free) behaviour and, de facto, opens up new possibilities for designs that combine structural efficient solutions with traditional materials. Fallacara, Giuseppe and Mauriziom Barberio. 2017. Parametric morphogenesis, robotic fabrication & construction of novel stereotomic hypar morphologies: Hypar Gate, Hypar Wall and Hypar Vault. In: Handbook of Research on Form and Morphogenesis in Modern Architectural Contexts, ed. D’Uva Domenico, 329-353. Hershey: IGI Global. 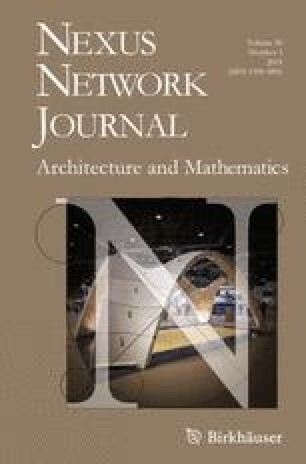 https://www.igi-global.com/chapter/parametric-morphogenesis-robotic-fabrication-and-construction-of-novel-stereotomic-hypar-morphologies/198095. Accessed 2 October 2017. Fallacara, G., Brocato, M. and L. Tamborero. 2010. E. E. Viollet-le-Duc et les ossatures constructives mixtes: spéculations morphologiques et constructives sur le thème de l’arc armé, IIe colloque international de Pierrefonds. http://www.atelierfallacara.it/_download/Articoli/47.pdf. (accessed 1 Nov 2017).